system is equipped with economical state-of-the-art purification technology. Ultra Clear UV UF System: HPLC, IC, GC and GC/MS, TOC analysis, ICP and ICP/MS, DNA sequencing, RNase- and DNase-free applications, IVF, and more. This special edition is equipped with a control panel made of hardened glass with LED lit capacitive sensors. 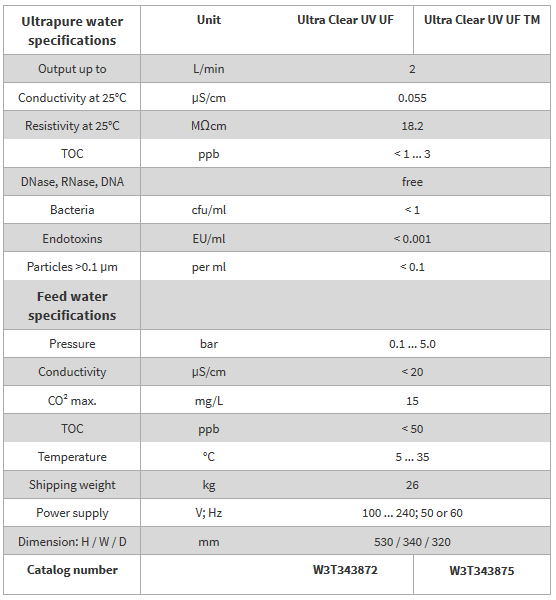 Water quality with a resistivity of 18.2 MΩcm and a TOC level < 1 ppb far exceeds all reagent water quality standards including: ASTM Type 1, CLSI and ISO 3696 Type 1. All systems that include UV oxidization, TOC monitoring and ultrafiltration produce the highest possible water quality. These units deliver RNase-, DNase- and DNA-free water. These systems are also capable of producing purified water with endotoxin levels of < 0.001 EU/mL. The dispense flow rate of ultrapure water is up 2 L/min. The high resolution display indicates the water conductivity in µS/cm or resistivity in MΩcm with the corresponding water temperature. Cartridge changes are very simple and fast due to quick and easy access to the replacement parts. A single UV bulb is used for the oxidization of organic compounds and TOC measurement. The energy saving operation mode enables the user to program the running cycles according to the real needs. The use of a single UV lamp results in much lower annual running cost compared to the competition. A flexible remote dispenser enables the user to dispense water where it is needed. A built-in automatic self-cleaning/sanitization mechanism extends the life of the ultrafiltration module. Pure water dispensing is made easy by simply activating the valve lever. A continuous flow of pure water is achieved by simply placing the draw-off lever in an upright position. Our new systems are available with special features such as volume control dispensing, a 24-hour-circulation mode and integrated RS 232 interface for data recording. Ultra Clear™ systems are delivered with the first set of all cartridges and filters included.